Becca‘s prompt for Write on Wednesday was a fourth p…. provoking. What do the three P’s of writing…practice, pleasure, profit…mean in your writing life? There must be some kind of shift of mind that takes hold about rejections. To work with the rejection you seem to have accepted it as an encouragement to ‘back to the drawing board’. Smart gal. One gets used to rejection quickly, in this business. I continue to try and focus on the joy of the process, rather than the reward for the result. It’s the only way to survive! I’m beginning to realize I know a true writer! What a joy. Writing has so much to give, so much to teach, so many surprises. That thing you had to force yourself to do – the actual act of writing – turns out to be the best part. It’s like discovering that while you thought you needed the tea ceremony for the caffeine, what you really needed was the tea ceremony. The act of writing turns out to be its own reward. Yes! That is it exactly. If I can hold that thought somewhere in a corner of my consciousness, I feel content in my writing. I must admit I also have little reasons – little excuses – for why my work was rejected. Such as – there are so many people trying to be published. It is a very subjective business, and one must be approved by an agent, and then there are five or six other hoops to jump through before the top guy in the chain says, “Okay, let’s publish this book.” Those hoops have a lot to do with salability, which is a huge, huge part of convincing someone to publish your work. The comment I received in this most recent rejection was “there’s not a big market for [them] these days.” As my nephew said when he was four years old and had put all three of his pennies in the bubble gum machine, “All my pennies shot to hell and I didn’t get a single green one.” Should I have decided not to write that particular book, knowing that there wasn’t a big market for it? How could I have known, when I started the book, what the market would be like today? Should I figure out what the market is going to be when I believe I can have a manuscript finished, and write whatever that is? No, of course not. I just have to write for myself. Writing on this blog is my practice, and I certainly don’t make any profit from it. It forces me to do something that is difficult for me – I write it, post it, and someone reads it and immediately has an opinion. I don’t necessarily hear what that opinion is, but I know they have one. It doesn’t even matter to me whether their opinion is positive or not – that is not the point. The point is, I let someone into my brain, and that is difficult for me. Of course the writing part of the practice doesn’t hurt either, but I am better at writing than I am at revealing. The better I can get at that, the better my writing will become. Writer Not Reading, who says so many things so well, said, “Good writing requires passion. It also requires the part … that makes you feel as vulnerable as a skinned cat: risk-taking.” That is what I need practice at. I’m reading along and suddenly a word or phrase or scene enlarges before my eyes and soon everything around me is just so much fuzzy background… The book – this beautiful creature in my hands! – is everything I’ve wanted; as unexpected and inevitable as love. Where did it come from? How did I live without it for so long? I have to read and read and read, all the while knowing that the more aggressively I pursue my passion, the sooner it will end and then I will be bereft. It would be lovely if something I wrote evoked that kind of reaction in a reader some day, but I don’t write with that thought in mind. It is enough that I feel that way when I am writing it. All writer’s face some sort of pressure (maybe that is the fifth p), whether self-induced or from an outside source. I have an angel on my right shoulder who I try very hard to listen to, exclusively, and who puts no pressure on me. I also have a devil residing on my left shoulder, to whom I allow myself to say “shut up” to regularly. There is an interesting story behind an incredible manuscript written in the 13th Century. 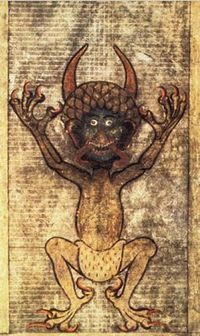 The monk who copied this manuscript had an altogther tougher devil than I. 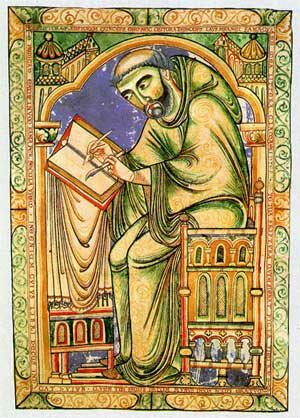 [This monk]…attempted to expiate his guilt by writing the world’s biggest book in a single night. Realizing the task to be beyond his powers, he invoked the aid of the Devil. The Devil aided him, had his portrait painted in the book and demanded the monk’s soul as payment. The monk was rescued but lost his peace of mind, until finally he turned to the Holy Virgin, beseeching her to save him. She agreed to help but the penitent died on the very point of being absolved from his pact with the Devil. The Codex Gigas, created at the monastery of Podlažice in Bohemia is now preserved at the National Library of Sweden in Stockholm. It is 36 inches tall and 20 inches wide, and weighs 165 pounds. It is an incredible book. The lesson of the story is, don’t listen to that devil, and just write for yourself. What beautiful illustrations to compel a perfect point (more Ps, I know). . . that pressure is something we all feel, as is the self-doubt you mention. But keeping in mind this thing of process and of practice – that is where the soul of the writing is. Hi Andi – yes, beautiful illustrations. I really enjoy illustrated manuscripts. I had a peek at the Book of Kells this summer – the high point of my trip! You are absolutely right, process is the soul of writing. As usual, a wonderful post with so much to think about! I love the quote from Ann Lamott – it’s one of my favorites from that book, and I come back to it over and over. The whole process of writing teaches us so much about ourselves. And then, for the lucky reader, the education begins again in a new way, as your quote from Sara Nelson illustrated so well. Ages ago I read something about creativity that suggested you should always keep it as just the best, most fabulous hobby ever. If you decided you had to be published or that you were diminished as an individual somehow by rejection, then you lost access to all the pleasure that creativity could give you. I really believe this. You have to write what you want, what pleases you, and if someone else likes it too, great. If not, well, the point was always the writing, wasn’t it? And I must read Ann Lamott – I seem to find her name cropping up all over the place lately. Thanks, Becca. It was a great prompt – really set me thinking about WHY I write. I am so pleased I finally brought Bird by Bird home. There is something to quote on every page. Hi Litlove. Yes, I think you will enjoy Ann Lamott. She is so unassuming and insightful and funny. You are absolutely right, the point is the writing. I do not want that to ever get away from me. The idea of writing being the most fabulous hobby ever is perfect. One thoughtful post. I write more for pleasure. I never profited out of it! gautami tripathy – Thanks for commenting. Absolutely – profit pretty much comes from pleasure, no doubt about it. I do find practice fun. And then there is the saying, “practice makes perfect!” I am still waiting for that day…. Whoa … that an evil image … that’s messed with my train of thought, disrupted my comment and got me leaving here till next week …. Brrrrr !!! Sorry it disturbed and disrupted you, Redness. Just think of that poor monk who had to work with that devil!! My devil is not quite as scary looking, and does not exact such an extravagent toll.